3. Overnight with free shipping will be delivered to your door. Airfreight will have to be picked up at your airport which receive freight of Southwest or Delta. Our Aquacultured Live Rock is one of the best available in the industry. We have the oldest offshore aquacultured live rock site in the Florida Keys, and its unique location results in some spectacular live rock (Federal Lease Site). We also have another lease site closer to shore (State Lease Site) which is not in heavy use right now. We hand select and pressure clean every rock (Miami Oolite – extremely porous type of limestone ) that goes in the water, and leave them on the bottom for at least two years until they are ready to be harvested. We don’t buy machine sorted rock so we don’t boast of having millions of pounds of rock in the water, but what we do have is very high quality. By our standard, Aquacultured Live Rock is not ready until it has at least 75% coverage (time of harvest) by some sort of coralline algae or other durable, reef friendly, encrusting invertebrate. Some of rocks will have some sort of live coral growing on them, usually some sort of Porites, Siderastrea, or Millipora. Green macro algae such as Halimida are also common, as are a wide variety of brown fleshy algae. Compared to most other live rock harvested in the Gulf of Mexico, our live rock is 100 % Aptasia free. This rock is completely different from Gulf of Mexico rock. Our live rock goes through cycles throughout the year which means sometimes with we have more macro algae and sometimes hardly anything. Our most sought after and best reviewed live rock. Fresh rock, straight from the ocean containing a lot of coralline algae, bugs, starfish, crabs, shrimps, sponges, feather dusters, macro algae, corals. 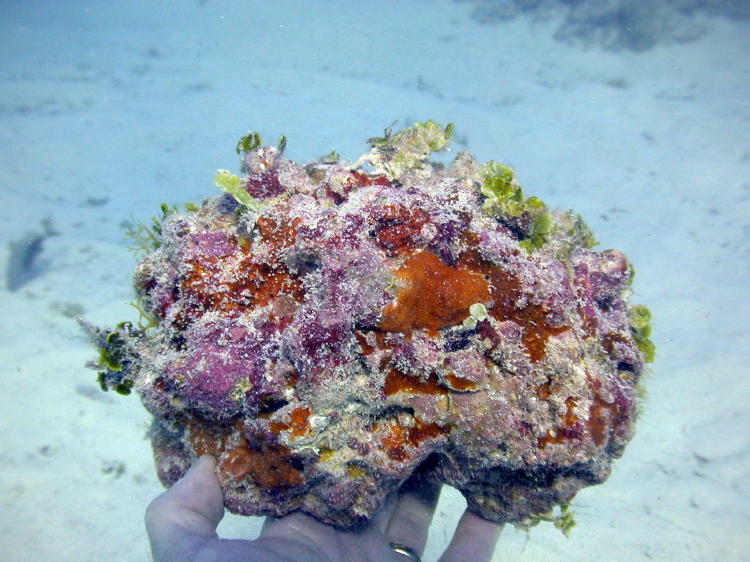 Some die-off of the most sensitive sponges are possible after shipping and this rock will have the strongest cycling (spikes of ammonia, nitrates and nitrite). – We ship it UPS Next Day Air. Very similar to the uncured live rock, most of the very sensitive organism on the rock which would most likely not made it during transit have already died off in our tanks, fewer sponges, bugs, starfish, feather dusters and corals, often fewer hitchhikers, normally cured for around a week in our system before shipping. – We ship it UPS 2nd Day. Slightly reduced coralline algae due to the curing process, hardly any sponges, less hitchhikers, corals, very few (if any) macro algae, re-curing is sometimes necessary with a longer transit. – We ship it UPS 3 Day Select®. After the arrival of the live rock rinse the live rock in a 5 gallon buck with freshly mixed saltwater to remove any debris or died of organic matter. (Optional Step) Undesired critters (we really don’t like the word unwanted pests as every creature has a purpose in life) can be removed by submerging the live rock into a saltmix of 1.035 to 1.040 (Specific gravity) for one minute. You can leave it a little longer but it should do the trick for mantis shrimp, crabs and worms to vacate the rock. Please turn the live rock in the bucket for the salty saltwater to penetrate everywhere in the live rock. Afterwards you can evaluate which crabs to keep and which ones to permanently remove. You can repeat this step 2 to 3 times during the curing process (before, during and after). It will help with keeping the unwanted critters under control obviously it doesn’t guarantee 100% success but it should get very close to it. You have two options to cure the live rock: You can place into your designated curing container which can be a trash can etc. It should completely cover the rock. When you are setting up a new aquarium, you can also place into straight into the aquarium and turn on your filtration equipment like the tank is running (It will need to be cleaned more often in the beginning). We recommend to turn off the lighting for both options. Specific gravity of 1.023-1.025 with freshly mix aquarium salts is recommended. Both options require water changes and daily testing of ammonia, nitrite, nitrate and pH. You also need to aerate the curing container option as well as a small powerhead can be very helpful to keep the water moving. The powerheads and the pump in the aquarium are sufficient for this job. Perform 30% water changes daily in the first 3 days. Keep a close eye on your tank levels (ammonia, nitrite, nitrate and pH), perform bigger water changes if they the levels go much higher. Afterwards perform biweekly water changes of 50% until your levels read zero. When the levels read zero for a couple of days, your tank has cycled and is ready to be used. The curing process can take from 1 to 3 weeks. We have had customers not performing any water changes which led to high levels which ultimately killed all the life on the live rock. I received just over 50 pounds for my 3 tanks. I can’t even believe how gorgeous this rock is. Especially compared to the nasty dull stuff I was getting locally. I have never seen so many colors of live rock in the fish shops anywhere around here. We’re 2 weeks into curing and haven’t even gotten up to .2 ammonia yet, so IMO it hasn’t even been a bad cure. I wish I had started with this stuff in the beginning of my reef keeping journey, if you take the plunge you will not regret it! I’ve been in this hobby for around 32 years and this is some of the best live rock I’ve seen in a long time. The amount of life, colors, and freshness reminded me of the good old days of Marshall Island live rock. The hitchhikers that came with the rock are amazing, including: 5 stony coral colonies, macroalgae, snails, crabs, sponges, tunicates, etc. Very impressed with this rock and will definitely order from KP Aquatics in the future. I compared the live rock for sale in several local fish stores and thought that the word “live” was being used loosely. I stumbled upon KP Aquatics through a google search and I am SO happy I did. Their prices were very reasonable and I liked that their plot is in the Keys rather than the Gulf meaning no Aiptasia. We received our package promptly and unwrapped a dripping wet array of rock that made our jaws drop. We have to date found an Emerald crab, a beautiful brittle star, several snails, two pistol shrimp and a mix of worms that are already burrowing and turning our sand bed. We could not recommend AP Aquatics enough. I just got my nano PKG in and it was packed so good. it can USPS 3 days from FL. to Wyoming. insulated box double bagged and wrapped in wet paper towels. the rock was still wet! nice color, size and shapes with holes for fish and corals. not the heavy dense stuff that some FL. aquaculture places send out. over all I am 100% satisfied. and thinking about another 10# this is my 2nd order form Kara & Phillip, and i see more in my future. great ppl and great company. so if your thinking about some LR do it! Got another 10lbs yesterday of uncured rock. They collected it on Sunday, and it was in my tank on Wednesday. Fantastic coralline coverage, tons of sponges, and a few bristleworms. Had a dead pistol shrimp and some tiny crabs that also didn’t make it, but did have a 6″ eunicid worm that was hanging out in the bag. He doesn’t look like any bristleworm that I’ve ever seen, so he didn’t make the cut! Overall, once again very pleased with the order! If you’re considering live rock, go for the uncured stuff!! Received the nano rock pack the other week and the rock looks great! There is very nice color on it. The USPS 2-day priority shipping took 4 days to my house, so you might want to look at a faster shipping method…I’m going to have to cycle it for awhile in a bucket before I can use it in my tank. But, very satisfied with the rock and the great packing of it! I ordered the 10 lb. Nano Package for my Fluval Edge 12 gallon tank. I emailed KP Aquatics and wrote in the notes section when I placed my order that I needed live rock to fit through the 4″ by 7″ opening on top of my tank and could I have rock with a lot of holes. I received an email from Kara that stated that she would hand pick my live rock for holes and measure them so that they would fit in my tank. She called me by phone to tell me that she could not find enough small pieces of live rock but had some longer pieces. She emailed me pictures of that rock that she had hand picked and asked me if I would like these pieces, or wait until next week to process your order or can she break the larger pieces so that they would fit in my tank. I agreed to have the larger pieces broke into smaller pieces. I received my order in Minnesota from KP Aquatics in 2 days. It was professionally packed and the live rock was fantastic and unbelievable! I’ve worked in the saltwater and reef tank business for over 10 years, I have received live rock from numerous suppliers in Florida and without a doubt KP Aquatics blows them all away with their customer service, quality of product and low prices. So in closing, don’t waste your money and time on other suppliers of live rock instead buy from KP Aquatics. Fantastic quality! Loads of life (sponge, coralline, feather dusters etc.). I went with the partially cured live rock. Great quality and unprecedented service. Highly recommended! So far I have ordered two of the 10lb specials requesting uncured and both times the rock has been wonderful. Very high coralline coverage, a few bits of macroalgae (which my rabbitfish made quick work of), and nice sponges here and there. My first order managed to get me four pencil urchins, three mantis shrimp (which were AWESOME), a pistol shrimp, a glass shrimp, and a lot of copepods, amphipods, bristleworms, etc. The second order was completely barren when it came to hitchhikers, however. I couldn’t even find any amphipods or bristleworms, it was VERY strange, but that is the luck of the draw with uncured, you never know what you’ll get! Ordered 20 lbs to split in two tanks, great sized pieces. 4 nano sized pencil urchins, 1 pistol shrimp, 4 emerald crabs, various snails and worms. Yes there was at least one small rock crab–but this is UNCURED, and purchased with foreknowledge of some pests possible. awesome live rock, delivered super-quick, looks amazing in the tank, teaming with life! Ive only had my rock for three days and i have noticed tons of macros, some sponges, coralline algae, a feather duster, a serpent sea star leg, 2 Bristleworms and what i believe to be a chiton of some sort! Received about 20 lbs of live rock today and it’s nice. I asked for larger sizes and received three nice pieces. Each is full of color and a nice set of plant life and even a small coral colony. The shapes are nice and have some nice holes. I’m already seeing feather dusters and sure I will be discovering lots of new life. Thanks Kara. Excellent live rock at a great price I paid for 2 day air should have gone with over night but still came with a ton of life great rock and full of pores just awesome thanks ken I give you Five Stars!!!!!!!!!!!!!!!!!!!!!!!!!!!!!!! Live rock is beatiful. Best I have ever seen. Covered in coraline algae, plants, and creepy crawlies. What a deal!!! If you combine the product, price, and service, this simply can not be beat! Communication is spot on, packaging is awesome, and service outstanding. The rock has lots of encrusting life on it – lots of great colors of algae, sponges, and macro algae. The picture represents the 30lbs I received well in terms of life and also shape. Even with 2-day ground shipping, the rock was still fresh, likely due to the great packaging. Thanks!!! Very nice live rock, I’m seeing new life daily. Cycled my aquarium with this and couldn’t be happier. Great rock! Full of life and algae and hitchhikers! I have not words to explain how happy I am with the rock I got from Ken. My email was giving some problem which caused some communication issues. But Ken was very patient and understanding through out. I got the rock this morning and I am very very impressed with the packing. No leaks what so ever. The rock was first wrapped in wet newspaper individually (yes each rock) and then placed a large piece of newspaper soaking wet and then placed in heavy plastic bags (double backed). The inside a styrofoam box with heat packs and then inside a cardboard box with tropical fish signs all over. The rock is a beauty. Lots of algae, peanut worms, slugs what not. Its curing now in a tub and I spent several hours just looking at it for all kinds of cool things……Ken treated my 25 lbs order the same way as any other …very professional. I will always order from you…I am not sure why anyone buys rock from other sources! I bought 250 lbs. Straight out of the box, it was loaded with life– from corals, to urchins, to feather dusters, to various other strange things. It quickly cured, looks beautiful in my tank and seems to be establishing a strong population of beneficial bacteria. I couldn’t be happier with this rock. I also can’t say enough about the trouble that Ken went to—in the midst of a hurricane, no less–to get it to me. This is some amazing rock. Tons of life and amazing color. I will definitely be ordering more. I get more amazed at the attached sealife I get with each new purchase of Live/Living/Crawling/Breathing Rock. Excellent as always, great hitch hikers and color. Packaged well and good communication. Second time ordering this… and it is totally worth it! Why buy from a petstore when you can get living rock delivered to your door? This stuff is amazing. Very fun to watch. Great LR… Love the feather dusters, pistol shrimp, porites, and macro hitchhikers! Shipped well overnight, little die-off and very quick, easy cycle. I’ll be back! I am amazed by the quality of this rock. I bought 25 lbs for my 36 gallon Peacock Mantis tank to finish off the rockwork, and to add some to 2 other existing tanks. All of the life on the rocks is well worth the price. I got 2 small pistol shrimp, some kind of lobster, and many brittle stars, urchins, and macro algaes. I am extremely happy and satisfied. Thank you Ken. Extremely satisfied with the quality of this rock. Was able to pick up around 100 lbs both live and base rock in person from Ken. The previous reviews are totally accurate in regards to the amount of life emanating from the rock. In addition to the macroalgae, sponges, corals, and numerous worms, I found 2 nudibranchs, 3 pistol shrimp, a small urchin, a small scallop, 2 brittle stars, at least 4 mithrax crabs, 3-4 small hermits, and an astrea snail within hours of placing the rock in my tank. Find myself with my face pressed against the glass waiting to see what’ll appear next. Highly recommended. This rock is as described, and more. We ordered 25 pounds for our nano tank with 25 pounds of base rock. The base rock was about as good as what we saw in the LFS. The live rock had lots of small corals and feather dusters, 3+ species of green maco algae plus encrusting algae and inverts in lots of colors. There is so much interesting stuff on the rock that we decided to hold off on buying any corals until we see what grows out! Ken is fantastic to work with and delivered exactly how and when promised. I picked up 45 Lbs of Live Rock from Ken yesterday. I am fortunate that I live in South Florida, and Ken invited me to his shop to pick put my own rock. Every peice that he had was covered with purple and red coraline algae. There are also allot of sponges and algae and plant life. It was hard to pick out my rock as every piece that I looked at was nicer than than the last. The tank cleared up within 2 hours of installing the rock and sand. When the lights went out all the really cool stuff started to come out. Several feather dusters, tube worms, and a really cool bristle worm. I am not expecting much of an amonia spike in my cycle as the rock came out of Ken’s tanks and into a cooler filled with water, then into my tank at home all within 3 hours. The next morning my ammonia is 0. I asked Ken for some small pieces of LR to use as rubble for my refugium. This is not something that Ken normally stocks or sells, but his response was no problem. He gathered about 15 pounds of small pieces for me, and it is in my refugium in place of the bio-balls that came with my CAD Lights tank. This rock blows away anything that I have seen in the local fish sotres for as much as $9.00-$11.00 per pound for aquacultured live rock. It is not even in the same league as the dead stuff that everyone else sells. Ken’s excellent service and patient answering of my questions, only added to this excllent purchase! Great liverock. Sponges, coralline, chitons, worms, brittle stars, macro algae that’s already growing and even a small pistol shrimp. This was all on a 6lb order – can’t image what would come with a 40lbs order. Very good to work with and will be ordering from Ken again soon. Great rock, lots of color! Perfect size pieces and some really cool hitchhikers! Thanks Ken! The best Rock I have ever bought. Full of life and Hitchikers. W.S. cant touch the quality of Ken’s Rock. This Rock…AWESOME… I got 50# acouple months ago, I wanted to wait before reviewing…AWESOME…Plants, Sponges, Critters, and things that I don’t know where to classify them exept in the COOL catagory. I am extremely impressed with the quality of live rock I received. Upon ordering 40 lbs, I not only got the best live rock I have ever seen, but I also got hitch-hikers. I specified upon ordering that I like hitch-hikers, and I was not disappointed! I got urchins, tiny brittle and serpant stars, shrimp, corals, sponges, spaghetti worms, astrea snails, tons of halimeda, and big anemones (good ones, not apistasia/majano)! I am also impressed with the packaging and the fact this is aquacultured rock. It looks like it’s been on the reef for decades! Better than I’ve ever seen in any store, for sale or display. I cannot wait to order more! Awsome stuff. I searched the net for months looking for good rock, and Ken is the only guy that took the time to answer my questions, got me the right sized peices to build my reef in a 15H tank, and make sure I had the best shipping option to save me a little money. I have built my system totally custom, and have spent a lot of money of making sure everything is perfect, and this live rock was by far the best choice. Unlike a lot of other places, the rock actually looks like it does in the pictures. Quality stuff, I just placed another order! This is awesome looking rock with tons of life and lots of color. It’s pretty light and there are interesting shapes. There is some die-off so make sure you cure it first. Beats the pants off of store bought LR. Great price too! You can’t go wrong buying this stuff. Great communication also. This rock is absolutely amazing! The growth and little critters that come with it will blow your socks off as well as the colors of the rock. Really made our office tank a sight to see as we find something new almost every week! I had ordered rock online once before (different supplier) and was quite disappointed. What a different experience this was! The rock was incredible! It is full of life and packaged expertly so that I doubt I will have any die off at all. In fact, I went through the packaging materials after adding the rock to my tank and found an urchin, several mini stars, more than 5 tiny porcelain crabs and numerous other items…just in the newspaper wrap! All were alive and well, and the rock itself is gorgeous! Thanks Ken! Just received 15 lbs of this uncured rock from Ken, It is absolutely gorgeous. Tons of life on it, truly outstanding rock!! This rock is really “alive”! No reason to ever go to the petstore and pay the same price (or more) for rock which is dead in comparison. I wish I had seen this when I was setting up my tank! WOW how much can I ask for Coral, sea squirt, star fish, Oh yea and a great looking bunch of rock too. Within minues you can have an instant reef in your tank, with this rock. I was amazed at how much life this rock has, every chunk has fan or tube worms, lots of pink, purple, green algaes, lots of macroalgae (plant like) growing, my tang loves it. i even got a couple starfish that came out of it. and with the perfect sized rock i recieved, it made for perfect spaces for my fish to swim in and out and around all over. I am so glad that i got the uncured it is worth every dollar. Kudos to a smooth transaction, excellent reef rock, and super fast shipping, he really cares about your sealife. Well, It has been a couple weeks since I have gotten my live rock and I just wanted to add an update. The amount of coralline on this rock is incredible! Both pink and purple!! The macro growing on the rock has taken off and is doing fantastic!! Many many fan worms and little life forms that I have no idea what they are, but they are beautiful and colorful!! No big spike in my tank (which is cycling), ammonium has not gotten over .4ppm!!! Incredible!! Thanks again Ken!! WOW!!!! Just received my order of 50 pounds of uncured live rock from Ken and all I can say is WOW! BEAUTIFUL VIBRANT REDS, YELLOWS AND ORANGES !!!!! No bad hitchhikers could be found, but I had a ton of good ones!!!! Porites, Tube/Fan worms, Snails, a Gorgeous Cowrie, Good Crabs and even an Urchin!! And this is what I found on just the first night!! Cant wait to see what else might emerge!